WICHITA, Kan. - May 5, 2016 – Busily scurrying around Northwest Arkansas one recent week, a video production crew captured audio and images from a pair of family-owned farms that raise turkeys for Honeysuckle White® and Shady Brook Farms®, and scouted a third farm for a future taping session. While curious, the turkeys were mostly oblivious to the activity related to videotaping efforts that will result in 60-second online vignettes celebrating farmers who produce the turkey we enjoy eating. These short videos capture the essence of family farming, spotlighting the people who produce our turkeys. Our vignettes also help us increase awareness in the marketplace for Honeysuckle White® and Shady Brook Farms® turkey products. This is the second phase of a campaign that kicked off in January with a 30-second television ad featuring a Missouri turkey farmer. The first of the new online video vignettes will be placed on Facebook, YouTube and brand websites on May 8, 2016. The second vignette will debut in late May, with a third appearing mid-summer. These online vignettes complement that 30-second television commercial, which aired on the ABC, CBS, FOX and NBC networks during the winter months, and was also available on “Connected TV” (television that has Internet), including Hulu Plus, Netflix and HBO GO. An extended (90-second), video version of the TV ad is available via social media channels including Facebook. “These short videos capture the essence of family farming, spotlighting the people who produce our turkeys. Our vignettes also help us increase awareness in the marketplace for Honeysuckle White® and Shady Brook Farms® turkey products,” said Jan Hood, head of marketing for both brands. The vignettes also highlight that Honeysuckle White® and Shady Brook Farms® turkeys are raised without the use of antibiotics for growth promotion purposes. 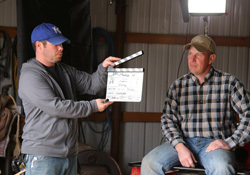 Northwest Arkansas farms featured in the online video vignettes include: Lazy J Farms, owned and operated by Tammy and Jeff Plumlee; Usrey Farms, owned and operated by Justin and Chana Usrey; and Double L Farm, owned and operated by Jeff and Gloria Lindsey. More information about Honeysuckle White® and Shady Brook Farms® turkey products can be found at www.honeysucklewhite.com and www.shadybrookfarms.com.